In a large sauté pan or cast iron skillet, melt the Sauté Express® Sauté Starter over medium heat until it begins to bubble. Pat the chicken dry on both sides. Add the chicken and cook for 5 to 7 minutes, or until browned. Turn and cook the other side until browned and the chicken is cooked through. While cooking, brush some of the Sauté Express® Sauté Starter on the side of the chicken facing up. Remove chicken and set aside on a plate. Add the olive oil to the pan. Over medium heat, sauté the onion for 3 minutes. Add the mushrooms and continue to sauté for 5 minutes. 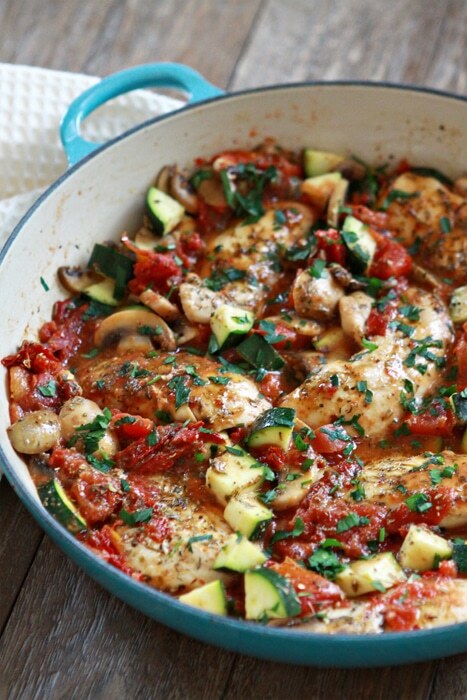 Add garlic, zucchini and sundried tomatoes. Sauté for 2 minutes. Add the diced tomatoes, Italian seasoning, and salt and pepper to taste. If using, stir in the balsamic vinegar. Transfer the chicken back to the pan and spoon some of the sauce and vegetables over top of the chicken. Cook, covered, over the stovetop or in the oven at 350 degrees F until the chicken is heated through and the sauce is bubbling.